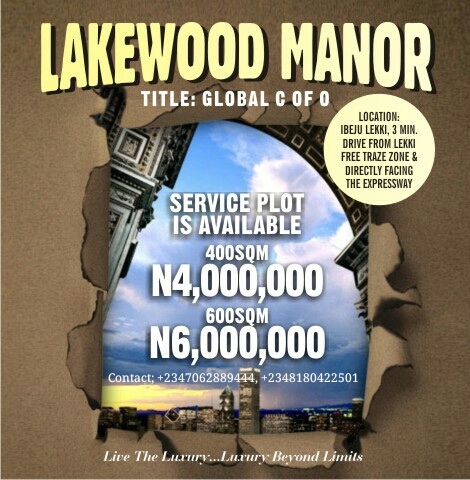 Location: Ibeju Lekki 3 minutes drive after lekki free trade zone and directly facing the Expressway. Lakewood Manor offer a range of life-enhancing amenities and facilities to discover a peaceful space to unwind and relax with the family. This is just the perfect place for yoga or to take a break and de-stress through meditation. The beautifully styled lobby and refined ambience of Lakewood Manor set the scene for the experience that awaits you. 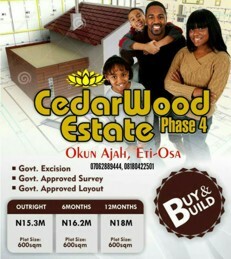 With 2,000,000 naira Initial Deposit You Can Pay within 2 Months as Outright Payment. Come home to luxurious apartments with tastefully appointed interiors, fitted kitchens, landscape garden, state of the art furnishing and many more.